With every opening order, CertiFresh supplies a custom mahogany display, featuring brass hardware and a beautiful gloss finish to complement your shop's décor. Our tube display by Ashton holds up to 60 single tubes or a combination of single and two-pack tubes. Our sleeve displays by Oliva are available in a four-slot or six-slot configuration and can hold 32 or 48 cigars respectively. All displays are complementary. 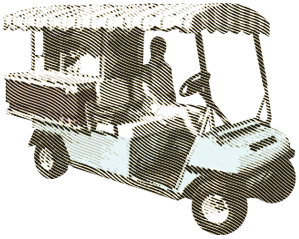 If you're not selling cigars from your beverage cart, you're missing out on significant additional sales! Customers won't often go all the way back to the Pro Shop for another smoke, but they will buy one off the beverage cart. the ice in your beverage bins. cooking in the hot sun! staff so they can show golfers which cigars are available. 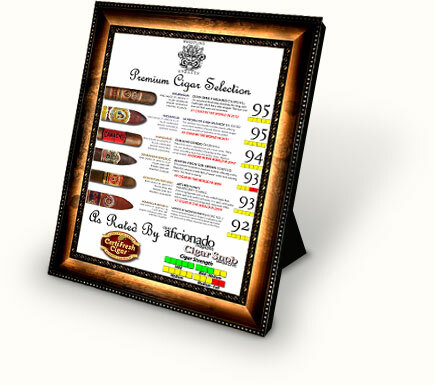 Every order of three or more cigar brands includes a custom-made menu featuring the Cigar Aficionado Magazine and Cigar Snob Magazine ratings. We include menus with easels on the back for placement next to our display boxes and menus for each of your beverage carts.